A coach for speed and strength. Running is simple, we put one foot in front of the other, and allow it to happen naturally. That is how we start, but once we get into running a little more, we want to learn more about how to improve our speed by increasing our step frequency and step length, we want to know which foods will give us the most energy on our runs, and we want to understand which energy systems we use in a 400m sprint. There are so many questions, and there is so much to learn about running. If you want to be the best runner you can be, these are areas you probably want to start paying attention to. If you want to increase your running speed, you probably already know that it is actually not your speed holding you back, but your aerobic endurance, and while knowing what to eat before, during, and after each type of training run is very important, I should firstly introduce the physiology of energy metabolism during different levels of exercise. 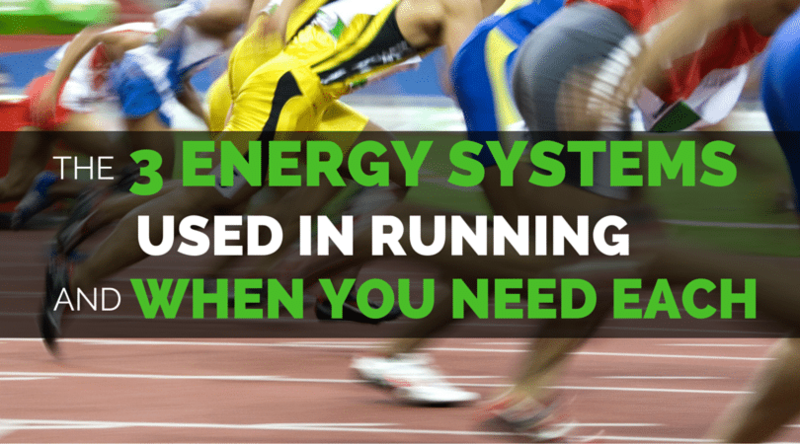 If you need the aerobic energy system explained, you are in the right place. Today we we break the three energy systems down, so you can learn how you have the energy to sprint as fast as you can, how the anaerobic energy system works, and what the aerobic energy system is. Why do I need to know about energy metabolism? Knowing the predominant energy system you are using during your workouts will help you determine your recovery needs for nutrition and rest. Energy is stored in the body in various forms of carbohydrates, fats, and proteins as well as in the molecule creatine phosphate. Carbohydrate and fat are the primary sources of energy, with protein contributing a minimal amount under normal conditions. Adenosine triphospate (ATP) is the body’s usable form of energy. The body uses 3 different systems of metabolism to transfer stored energy to form ATP. What are the 3 Energy Systems? 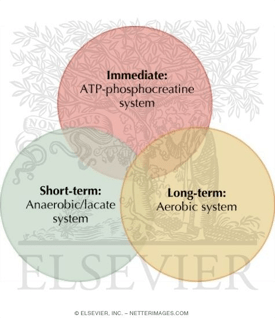 The phosphagen system of energy transfer does not require oxygen (anaerobic) and is called upon when there is a sudden increase in energy demand such as starting a workout, starting explosive hill sprints, or throwing a discus. It is the most direct and quickest form of energy production but can only supply enough energy for a short burst intense activity like a maximum weight lift or a 5 second sprint. This system relies on the availability of creatine phosphate, which is in limited supply and is depleted quickly. When creatine phosphate is used up, the body must call on other systems of energy transfer to sustain continued activity. Another system that doesn’t require oxygen is glycolysis, also known as the lactate system. This system provides enough ATP to fuel 1 to 3 minutes of intense activity when adequate oxygen isn’t available for aerobic metabolism. Lactate or lactic acid is something that most runners have heard of and may even fear because of its connection with sore muscles and fatigue. Hopefully the following explanation of glycolysis will help you picture what is going on. Glucose is the only fuel that can be used during glycolysis, which literally means the breakdown of glucose. This breakdown creates ATP as glucose is converted into 2 molecules of pyruvate. Hydrogen is also produced during this process and if oxygen is present, the aerobic system (explained next) can use hydrogen and pyruvate to produce more ATP. However, often times the aerobic system cannot keep up with the excess hydrogen being produced so instead the hydrogen combines with pyruvate to form lactic acid. Lactic acid then enters the bloodstream and is cleared by the liver. The point at which the production of lactate is faster than lactate clearance is called the lactate threshold, also referred to as the anaerobic threshold, when lactic acid begins to accumulate in the blood. The increased acidity of the blood inhibits the use of fatty acids for energy production through aerobic metabolism and thus increases the body’s reliance on carbohydrate and glycolysis. As blood lactate levels continue to rise and carbohydrate stores become depleted, the muscles begin to fatigue and performance is diminished. An athlete can increase their lactate threshold through adaptations made during proper endurance training. This is where my knowledge of the lactate threshold ends and I leave it to the expert coaches to figure out the best way to do that! I will say though that one of those adaptations is the increasing the efficiency of the aerobic system. The aerobic system can use carbohydrates, fats, or proteins to produce energy. Energy production is slower, but more efficient than the other two systems. As you can tell by the name, the aerobic system requires that there be adequate oxygen available to the working muscles. Therefore this system is used more heavily during low-intensity activity, but actually, most of our races, even a 5k mostly use the aerobic system. One key highlight of aerobic metabolism is the ability to burn fat as fuel. Our bodies have a seemingly unlimited capacity for storing fat and fat provides over twice as much energy per gram than protein or carbohydrate, making it a very attractive choice for energy production. In prolonged activities where intensity is low, the body will use fat as a main energy source and spare the use of muscle glycogen and blood glucose so that it is available for use if exercise intensity increases and oxygen availability is decreased. Keep in mind that aerobic metabolism doesn’t use one substrate exclusively. Although you may be burning mostly fat, a steady supply of carbohydrate is still necessary for the breakdown of fat into an energy source. Just like the aerobic system isn’t exclusive to one substrate, energy metabolism isn’t exclusive to one system. All 3 systems are working simultaneously to fuel the body during exercise. However, certain characteristics such as exercise duration and intensity will determine the predominate system and thus how long the activity can be performed at that level. Other factors that influence what substrates and systems are being used include the fuels that are available, the fitness level of the athlete, and the nutritional status of the athlete. These factors may change over time and through training so just like overall nutrition, energy metabolism is very individualized and dynamic. What Should I Eat Before Running Workouts? If you are still wondering about eating before a run or workout, make sure you go back and read more about when you should and should not eat before. One big reason for having adequate fuel before a workout, as well as on a daily basis, is to prevent the use of protein as a fuel source. Protein is usually spared from being used as an energy source and is used predominately by the body for tissue maintenance, growth, and repair. However, when glycogen stores are depleted, amino acids from muscle protein can be used to produce glucose. As we learned before, glycogen stores can be depleted through intense and prolonged exercise, a chronic low carbohydrate diet, or an overall low-energy diet that cannot keep up with the body’s demands. If the body consistently relies on protein for fuel, muscle protein stores will begin to decrease along with lean body mass, which can be detrimental to performance. This highlights the importance of fully replenishing glycogen stores after intense workouts, as well as on a daily basis. It doesn’t just taste good. It’s also good for muscle recovery. No gluten, no meat, no dairy: You know the story. The don’t-eat-any-foods-from-your-childhood diet has been in vogue for a while now, but one “bad guy” seems to be making a comeback, at least among athletes: milk. So, chocolate milk over regular milk? Both are good choices unless they cause digestive issues, says Rebecca Scritchfield, a D.C. nutritionist. But flavored milk — be it chocolate, strawberry or vanilla — has a more beneficial ratio of carbohydrates to protein for muscle recovery and rebuilding, Scritchfield says. In other words, there is nothing magical about the cacao itself in chocolate milk; it’s the extra carbs — the sugars — that create the perfect potion. “Milk alone may not be enough carbs or calories, but it can be enhanced to be adequate,” Scritchfield says. The ratio to aim for is 4 grams of carbohydrates to 1 gram of protein, according to Joel Stager, professor of kinesiology at Indiana University and the author of several research papers on milk as a recovery drink for sports performance. Nelson says that immediately on entering the body, milk creates spikes in insulin (in this case, these are good for you) that help transport sugar into the muscle, where it becomes glycogen. It also stimulates muscle protein repair and growth. The amount of carb-infused milk recommended can range anywhere from 8 to 16 ounces depending on the intensity, frequency and duration of the exercise as well as the person’s gender, size and age. So, let’s do the math on milk vs. flavored milk to reach the right 4:1 ratio. An eight-ounce glass of 2 percent milk has 12 grams of carbohydrates and 8 grams of protein. Nowhere near the recommended 4:1 ratio. That means — should you choose to make your own post-exercise milk drink — you would need to add about 20 grams of carbohydrates. For example, a small banana has about 20 grams of carbs. Voila! There is your flavored post-exercise sports drink.